Teddy hasn't been able to ride amusement park rides for a long time because of sensory issues, so we haven't even thought of taking a trip in an airplane because of the risk involved (maybe he wouldn't get on the plane? he might melt down when we're in the air?) But when my husband asked Teddy on a whim if he'd like to take a plane ride in the little 4 seater at our local airport, Teddy surprised us both and said yes! We decided to make it his 11th birthday present and Teddy was excited and ready. Then the day of his birthday he came home from school in tears, worried about flying. We both talked to him, calmed him down, and explained that if he didn't want to, he didn't have to. We would just go look at the plane and then come home. This eased his mind a lot! When we got to the airport Teddy's spirits perked up. He loves watching the planes take off and land, so he started getting excited. 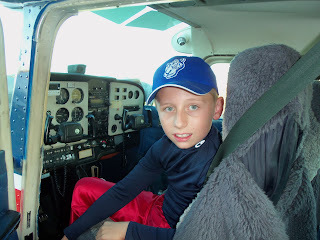 When the pilot got there and asked Teddy if he was ready to fly, he said "YES!" Alan and the pilot got in the front seat while Teddy and I rode in the back. When the engine started he got a little nervous about the noise, but Dad gave Teddy his headset and from there on it was smooth sailing! Teddy wasn't bothered about the motion of the plane, the sounds, or the heights. It was a wonderful achievement, and we're so proud of our big guy! When the doctor tells you that your infant or child has survived a stroke or that they may face life with part of their body paralyzed, time seems to come to a screeching stop. Suddenly those dreams that you once held for your child are shattered into a million pieces. On the Pediatric Stroke Hope blog, we'll share stories of hope about our babies and children who are stroke survivors. We'll also share stories about children who have hemiplegia, a paralysis or weakness on one side of their body. These kids are amazing and we hope that their stories will give you new dreams for your child. This site is sponsored by the Children's Hemiplegia and Stroke Association (CHASA).